Love Farmlab. I can never make their Friday midday shindigs but I am sure they are interesting. They have a wonderful location overlooking, and using, the huge "cornfield" park. Check them out some day. 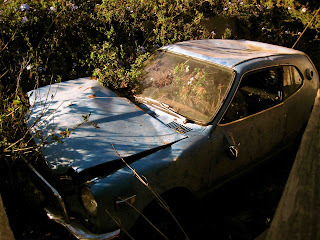 Rad Montecito Heights "Farmlab Imitation" car garden. Roscoe Holcomb "Fair Miss in the Garden"
Soul Runners "Grits N' Corn Bread"
classic old Honda - that thing needs to be rescued! Also a bad use for an Elky, couldn't they find an old taurus?